Advanced LED have their own research center from which they create some of the industry’s most efficient, powerful and longest-lasting grow light products. DS XML 350 is an example of their research results. In short, the DS XML 350 is designed for maximal spectral efficiency, the least electricity usage and maximum lifespan. Advanced LED back all this up with an industry-leading, hassle-free 3 year warranty. An exceptionally long life thanks to double-size LED heat sinks, advanced LED current drivers and a multi-fan, side-vent cooling system. 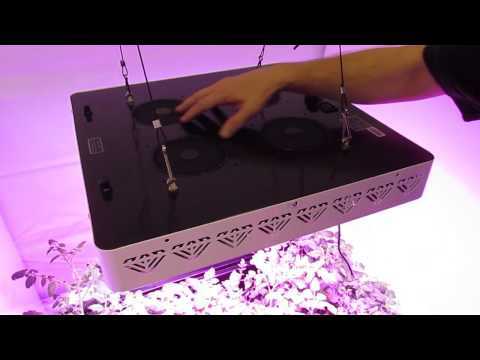 This is truly an advanced LED grow light. It features both 3W and 10W CREE single-chip LEDs that provide the most light for the least electricity. Twenty percent of the light output is provided by the biggest LEDs, which are supplemented by 144 3W CREE LEDs. While pulling 330W maximum from your wall outlet, the XML 350 puts out as much PAR light as a 600W HPS lamp. White and blue LEDs, provide your plants with total saturation of PAR light on both the red and blue ends of the visible light spectrum. The image to your right illustrates how well this light’s output lines up with the regions of light spectrum that plants need the most. The advanced LED collimator lenses direct light straight down deep into the plant canopy, which minimizes waste light at the edges. It can saturate up to a 4 x 4 foot growing bed at 24 inches height. Factors shortening LED grow lamps expected 50,000 hour lifetimes are poor current control and ineffective cooling. Many LED grow light manufacturers skimp on the LED driver circuitry, but Advanced LED uses the most advanced drivers to maintain tight control over current. Along with oversize heat sinks and generous ventilation, the XML 350 LEDs have 50 percent greater heat dissipation than many competitors. Previous Diamond Series owners are impressed with the improvements Advanced LED Lights has made in the new series and new LED grow light users have few, if any, complaints except perhaps for the nearly $1,000 initial price tag. Half of all reviews for the XML 350 note Advanced LED’s superb customer service. The turnaround time for light replacement when problems arise is usually less than a week. Obviously, Advanced LEDs recognizes a buyer’s urgency when a light fails in the middle of a grow cycle. The biggest raves come from buyers who are replacing an HID, HPS or fluorescent system when they experience the enormous heat reduction. They report a mere 6F to 8F temperature rise in their grow rooms, which means they can usually ditch their room cooling systems. The spectrum adjusting switches are a big hit as no extra lighting is needed to switch from veg to flowering modes. Many growers report that the DS XML 350 allows them to shorten their time to harvest significantly, almost to the point where they get one more harvest per year. One reviewer using the XML 350 and fluorescents saw her plants eagerly grow up and around the fluorescents to reach the LED light. Clearly, LED grow light technology is coming into its own as the premium light source for growing any vegetables, flowers or herbs. Those who downplay its merits are usually ridding themselves of old stocks of HPS, HID or other less energy- and spectrum-inefficient lamps. Those simply cannot compete with the DS XML 350’s over 17 PAR per watt rating. Advanced LED Lights continues to demonstrate their commitment to innovation with their latest Diamond Series XML lights with 10W CREE lamps, high-quality drivers and efficient cooling design. The Diamond Series XML 11-band, adjustable spectrum provides a versatile light that quickly pays for itself with intense vegetation, flowering and shorter harvest cycles. your ‘comment’ about the CONS of this unit (Advanced LED Diamond Series XML 350 Review) regarding: “Buyers unaware of long-term benefits may be put off by the price tag” is a discredit as I was, just now, pricing ‘all of the above’ and for the overall coverage, output, etc – this unit IS the BEST buy for the price. Many others were even more expensive.